Photo: PNC’s Grown Up Great announcement on April 4. Photo by Tracy Certo. Since 2004, PNC Bank’s Grow Up Great charity program has invested more than $160 million in grants to partner organizations dedicated to early childhood education across 19 states. Along the way, the bank’s employees have logged 850,000 hours of volunteer time. 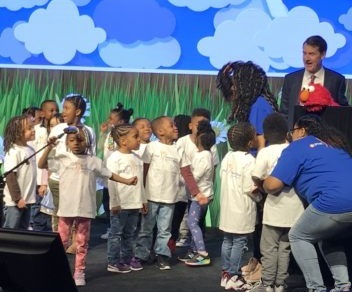 “Grow Up Great allows us to help our communities, not just with dollars but with involvement,” said Bill Demchak, the chairman, president and CEO of PNC Financial Services Group, at a packed event celebrating Grow Up Great’s 15th anniversary on April 4. At the event, PNC pledged to invest an additional $150 million in their many education and outreach programs across the country. The cash infusion, along with individual gifts over the last decade, brings the bank’s total investment in the program to $500 million. For the Pittsburgh region, this means up to $150,000 in newly available funds. Elmo was a big hit with the kids from Training Wheels Educator Center. PNC’s Bill Demchak simply couldn’t compete! Photo by Bill O’Toole. As PNC celebrated the milestone at their corporate offices Downtown, Sally McCrady, president of the PNC Foundation and an original manager of Grow Up Great, highlighted several partners that used their funds to pursue innovative approaches to education. Working with support from Grow Up Great, the Message from Me service was designed by a team from the CREATE Lab at Carnegie Mellon University in 2009. It gives young learners an educational platform to share their learning experiences. While the platform originally lived in plastic, child-friendly kiosks, today Message from Me is an app used in more than 200 early education centers nationwide. “There are hundreds of examples like this one across all of our markets, organizations that have been creative and thoughtful about how to use their expertise to inspire the joy of learning in young children,” said McCrady. In addition, the funding will allow PNC to supercharge their incentive for employees to participate in Grow Up Great. Starting this year, the bank will double the amount of money it donates for each hour of employee service to the program, from $1,000 to $2,000. PNC employees will also receive a $25 gift card to be redeemed with the charity Donors Choose, a long-time partner group that matches donors with underserved classrooms. The match comes on top of a pledge of $5 million to support Donor’s Choose over the next two years. As for new programs, the funds will also go toward the Great Big Book Drive, which runs at every PNC branch through the end of April, as well as new community programs with Fred Rogers Productions, which consulted on the formulation of Grow Up Great in 2004. The event on Thursday featured remarks from Demchak, a song by students from Training Wheels Education Center on the North Side and an appearance by the television personality Elmo. All the spring events Pittsburgh kids have been waiting for!